Knowing how to ride a bike is one thing, but having the ability to comfortably and safely share the road with other cyclists requires another level of skill. These basic handling techniques will help you enjoy the transition from bike rider to full-blown cyclist, and, as an added bonus, can help save a little time on race day. Whether riding on an open road or in a race, always look over your shoulder before swinging from one side of the road to the other. 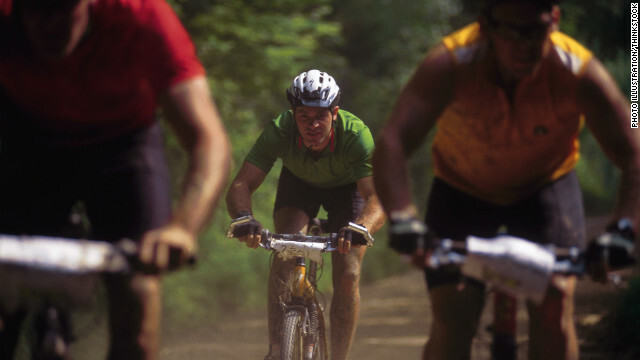 Before carving through a corner, always check your blind spot, especially in a race since the noise created by fellow cyclists isn’t always enough to alert you of their presence. Despite the chorus of concerned mothers teaching their children not to use the front brake, lest they flip over their handlebars, relying primarily on the front brake is the best way to slow your bike. It’s substantially more powerful than the rear. Don’t be afraid to squeeze the front brake with some gusto but, like moms say, don’t go crazy. Scoot back on the saddle when braking particularly hard so your weight rocks forward into the bike rather than forward and past the bike. As racecar video games have taught a generation of kids, tires have a limited amount of traction that can be used to corner, brake or accelerate. So, if you brake while turning, less traction is left over to stick you to the road. Slowing your bike before entering a corner then releasing the brakes when entering the turn will allow you to corner faster, safer and with more confidence. Body position and weight balance on the bike greatly impact balance, stability and traction when cornering. To create a solid foundation, turn the outside pedal to the lowest position and press hard through it with your foot. Use your inside hand to lean the bike toward the corner by pressing down on the bar. Rather than watching your front wheel, look 5 to 10 meters around the corner. The bike will follow your line of sight. If you ride a road bike, lean over into the drops for extra leverage on the brake levers and improved balance between the two wheels. When riding with other people outside of a race, either line yourself up side-by-side or completely in front of or behind your partners. Don’t allow your front wheel to partially overlap another rider’s rear (an unsafe position known as half-wheeling). The rider in front probably doesn’t know you’re there and can take you down with even a soft bump against your front wheel. Downshift to an easier gear before slowing or stopping - whether for a red light or an aid station - so the bike is in the right gear when you start re-accelerating. Learn how to reach your water bottles without taking your eyes off the road. Even a quick break in concentration can cause your bike to swerve erratically, so practice pulling a bottle without looking down. Next entry »What the Yuck: Can I mix coffee with my meds? The RBbell road bike bell is tomorrow’s bell, ergonomically designed for the modern day cyclist. Designed to enable a simple press of a button, without taking your hand off the handlebar. Riding a bike begins at a young age and it is important to instil in first entry riders the importance of safe cycling. Bikecorp stocks the bicycle bell under the RBbell brand in Australia. Bikecorp is a wholesaler of bikes plus bike parts and accessories. The article mentions the "line of sight" – but it needed to stress it as a point all its own, if not the #1. The bike goes where you look, its that simple. As a motorcyclist and mountain bike rider, this is THE most important point to make for control of the vehicles. Try it on a ride. When another bicycle is approaching, look at that bike and see where you drift – right into that other bike. Try it on a turn – look to the outside of the turn and the bike will pull outwards and you will make a wider than needed turn. Keep your eyes ahead and where you want to go, not on what you want to avoid. Its the first thing I teach anyone on a motorcycle or bike. Bikes go where you look – its not like a car where you can look around you and still go relatively straight. Being a tourist on a bike is dangerous. If you want to gaze at the sights, stop at a good spot (get off the path!) and look! Another point missed. Downhills! Shift your weight backwards! And rely on the rear brake more in these situations. Another point – for the casual "its a nice day lets go for a ride" riders. When riding on trails where there are runners, and walkers, etc...dont ride side by side and expect others to let you pass. Especially when others are approaching. One rider should be the one ready to drop back at all times. And the lead rider shouldn't be looking backwards to make sure their partner is keeping up, or slow down at passing moments so they lose each other. Each rider is responsible for their own safety and those of the people they are approaching – your riding separate bikes, act like it! And you family riders. Parents teach your kids they dont have the whole path to ride on! And the parents should split up and one be the lead rider that "pulls" the bike train and one that pulls up the rear. You don't own the path and everyone else should NOT have to be hindered by your troupe of weaving child riders. Safety is your job! Also the rules of the (automotive) road apply on bike/running trails. Keep to your side of the path whether its marked or not – there's a center line that all users NEED to be aware of at all times. Which is a great place for parents to teach their children the rules of the road. Note to the Bell advocates – dont wait till the last moment to use it. Especially when approaching runners and some walkers – who might be wearing earbuds, etc. Give them a warning some ways away so they dont jump out of their skin and into your path! Do not send cleaning, twice buy Tyrannosaurus glasses have this small drawback. If this point can change to improve the next it would be perfect. Quality, style, colors are good, praise! Bags received, good quality. Like with the store, received praise bag, good quality, a bag wild, like the bag received, good quality, packaging is also very good, fashionable bags received, good quality, carrying a good look and quality. Bags received, good quality, just like the seller described. Bags received, good quality, very atmospheric, the grade received acclaim bag, good quality, very good, like. Leather. I merely came across your web two or three days ago and I have been completely browsing it consistently. you have got a large vary of useful information on the placement and I additionally really like the actual form of the spot at the same time. carry on the good work! you are really a good webmaster. The web page loading speed is amazing. It appears your are performing any kind of one of a kind trick. Likewise, The information are masterpiece. you have done an outstanding job on the topic!